I headed south from the Stour Valley just a couple of miles to the Colne Valley. Colne is pronounced 'cone', incidentally. You can feel a change as you approach the village of Chappel and Wakes Colne, a village dominated by one of the largest railway viaducts in the east of England and divided into two parishes by the River Colne. There are two churches. South of the river there is just a pub, a school, a row of cottages and St Barnabas. Open. A sweet little church in the mid-Essex style, low walls with a little bell turret. 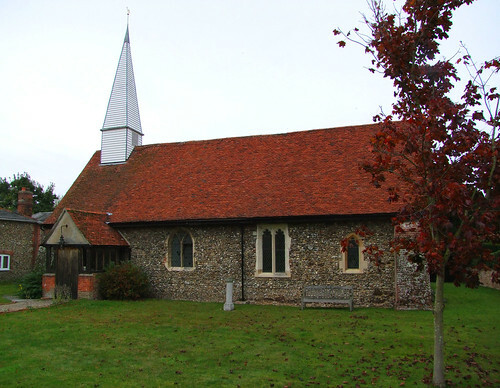 It is actually a chapel of ease to Great Tey, in which parish this side of the river is, hence the name of the village and also the reuse of the otherwise unusual dedication of the mother church. More like a non-conformist chapel than a parish church inside, but simple and pleasing, and with an atmosphere of sorts of its own.